Elena of Avalor has really found its footing this season, and this latest special did not disappoint. From the beautiful pink architecture of Elena's cousin's estate in Puerta Nueva to the new twist on the old mermaid vs. human tales, this special was everything I could have hoped for in a new mermaid princess story. 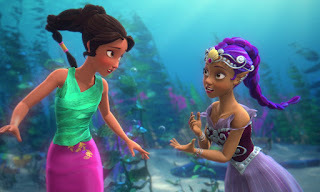 The sirenas are very different from the mermaids presented in Sofia the First as they have pointed ears, more colorful fashions, and appear Hispanic in ethnicity. They also possess the ability to hypnotize people with their singing, similar to sirens except that the song appears to work on anyone, not just lustful sailors. Unlike Sofia's Merroway Cove, which is a matriarchy ruled by Queen Emmeline, this kingdom has both a queen and a king. Princess Marisa's backstory reminded me a great deal of Dyesebel, another mermaid favorite of mine. Like Dyesebel, Marisa was born to both a mermaid and a human. This gives her the ability to transform her tail into a pair of legs (conveniently covered by hot-pink leggings) when she goes on land, as well as her brother Marzel. The lovely seashell and armor accessories that the sirenas wear are also reminiscent of a lot of the mer-fashions from Dyesebel. Princess Marisa is easily my favorite character introduced on Elena of Avalor thus far. From her gorgeous purple braid and sheer lavender dress to her incredible acting and singing, I was very excited to learn what sort of mermaid Gina Rodriguez's character would be. I loved that Marisa was a stubborn pacifist, fiercely supporting Elena no matter what anyone else said or did to try to deter her. Instead of falling in love with a human or wanting to live on land, Marisa sees herself as an ambassador of peace between the mermaid and human realms. She considers Elena her ally in accomplishing this because they are both fellow princesses and diplomats. Marisa's brother, Marzel, serves as the perfect balance to Marisa's optimism, representing the overall disdain that most of the sirenas carry toward humans. I love how Marisa was never swayed even a little by her brother's doubts, and her gorgeous character design filled me with glee every time she appeared onscreen. The weakest element in Song of the Sirenas was the new villain, Elena's cousin Cristobal. Having one back-stabbing two-faced cousin was already enough for them to need to introduce another. Cristobal had never been mentioned before this point in Elena of Avalor. The show acknowledged this when Elena said that Esteban was exaggerating when he claimed to be her only cousin, making Cristobal's introduction similar to Morgana's in The Little Mermaid 2, where Sebastian shouts "Ursula's crazy sister!" and the audience is just supposed to go with it. Fortunately, the special was so engaging before Cristobal's betrayal that it wasn't enough to take away the pleasure of watching it. There were also plenty of former villains that made an appearance in Song of the Sirenas including Elena's main nemesis Shuriki as well as Fiero and a brief glimpse of the greedy Victor and his daughter Carla. The addition of the Shuriki masks that several bystanders wore to throw Elena off during the parade were a clever touch. It was also nice to see that Elena is starting to get better at using her staff, since she has a much wider learning curve than most other princesses who posses magical devices. 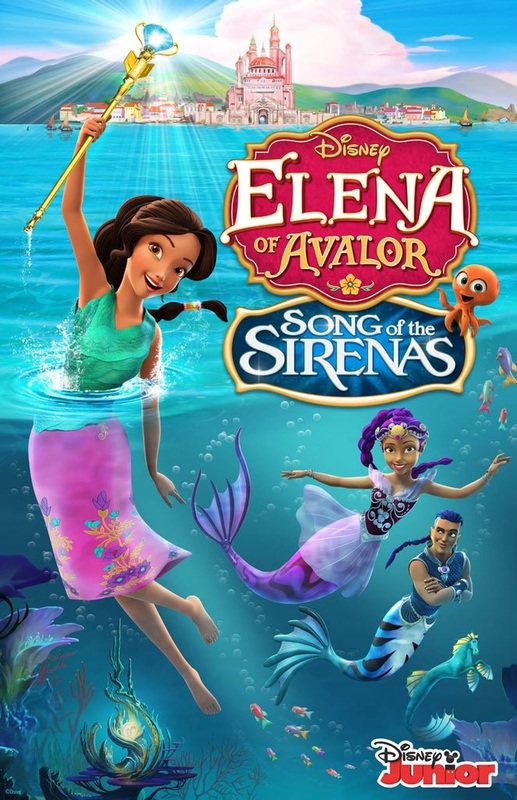 Song of the Sirenas was a pleasure to watch, especially after some of the more disappointing Elena specials I've seen in past. I was so pleased when I learned that they were doing a mermaid story since I wasn't sure they would want to compete with any of Sofia's territory. The sirenas were unique enough from other mermaids that Disney has created in the past to captivate mermaid fans of all ages and walks of life with a fresh take on the mythology. It was an absolute pleasure to hear Gina Rodriguez perform as a mermaid princess and an added bonus that her signature color was purple, my favorite! I thorough enjoyed the songs, story, and characters and look forward to more specials of this caliber in the future. After seeing this review, I realized I hadn't seen this ep yet so I hopped into my cable's On Demand to give it a quick view. And I pretty much agree with everything you said. Another great moment for me was the fact they gave Elena underwater breathing powers BUT didn't turn her into a temp mermaid (like they did with Sofia in her show) which would have been a wacky hand-wave, especially for a show that I think is aimed to appeal to an older audience then Sofia's show. This series started out with a VERY dark premise, an evil sorceress brutally killed Elena's parents, trapped her grandparents and younger sis in a picture and the heroine herself in an amulet for 40 years! The show has even confirmed that her parents are permanently dead and it will not use any magical hand-waves or anything else to resurrect them which I think is a very courageous and mature choice on the part of the show's creators. This is an interesting contrast to the origin story line of Mysticons' Kay, where her parents were petrified but not killed though rendered inactive for a while until Kay could get help to revive them. But though Kay was saddened she was not herself trapped in any form of magical confinement and in fact got a cool set of powers and sisters/bffs to help her protect her city and realm until her parents could be revived. So Elena had to spend quite a long time earning a happy new beginning and Kay got one in a much faster stretch of time. I'm actually shocked given this origin that Elena's show is on Disney Jr. but the show has been very gentle with its handling of Elena's family tragedy, not quite sugarcoating it but also not being blatantly cruel with it (they obviously don't want the youngest viewers to come away from watching the show being very sad or scared if it's not necessary). Do Princesses Want To Be Queen?